The settlement at Red River was a sprawling community, an “extended village” of diverse peoples living on river lots that fronted the Red, Assiniboine and Seine rivers. For much of its existence, at least until the growing influx of settlers from the Canadas after mid-century, Red River was a Metis settlement. A sprinkling of Scottish descendants of the Selkirk settlers, a handful of retired Orkney servants of the HBC, some French Canadian settlers and First Nations peoples, were dwarfed by a much larger population of French and English-speaking Metis who inhabited the settlement’s far-flung parishes. Reliant upon a mixed economy of agriculture, hunting, trading, provisioning, and occasional wage labour with the company, the Metis of Red River adapted to the realities of a self-sufficient life in an isolated colony. It was the multicultural character of the settlement that for much of its history provided Red River with its greatest strength. Changes after mid-century, however, challenged this vigour as diminishing returns from the buffalo hunt, the evolution of labour and property relations on the plains, the influence of the Anglican Church, and imported perceptions of race, class, marriage and kinship, underscored the sharp contrast between a full-time farmer and a hunter-trader and the distinction between a Catholic parish such as Ste. Anne and a Protestant parish such as Kildonan. Nonetheless, the commerce of the Upper Fort remained at the centre of life in the settlement, at least until a growing independent trade challenged the company’s traditional monopoly after the Sayer trial of 1849. Unable to rise within the ranks of the company hierarchy, and relegated to wage labour on the boats or carts, the Metis — both French and English-speaking — developed a growing independent economy, a new entrepreneurial class, based on the fur and buffalo robe trade and provisioning. But as Canadian annexationists moved into Red River after 1860 Metis agency and unity were challenged. The seeds were laid for the Resistance of 1869-70 and ultimately for the dislocation of the Manitoba Metis. Red River would be made over into English, Protestant Winnipeg and bring with it a new chapter in the history of the Northwest. 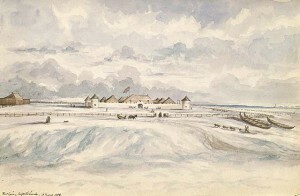 Throughout much of the 19th century Upper Fort Garry remained the centre of Metis Red River, the focus for commerce and trade, administrative activities, civil government, and judicial proceedings. From Government House, laws were enacted, and just outside the northwest corner of the fort sat the courthouse where the General Quarterly Court enforced the laws of the settlement, and a jail housed transgressors. Company operations at the Forks also included, for a time, an experimental farm located at the site of the nearby abandoned Fort Garry. Just beyond the walls of the stone fort, Metis cart brigades assembled, as did York boat tripmen. Local settlers travelled by boat, cart, or horseback to the fort’s sales shop to trade for imported goods, provide part time labour, or to meet with the Governor. First Nations — the Ojibwa, Cree, and Dakota of the region — also visited the fort to trade for provisions and to negotiate. The work for servants of the HBC at Upper Fort Garry was largely seasonal in nature. For the dozen or so permanent servants or “winterers”, which included officers, clerks, skilled tradesmen, storekeepers and labourers, most tasks were organized around the departure of the boat and cart brigades, the spring and fall buffalo hunts, the planting and harvesting of crops, as well as a host of other jobs dictated by the seasons. Company labourers such as William Drever or John Davidson, who served at Upper Fort Garry in the 1840s, spent their days repairing buildings and fences, cleaning the stables and warehouses, cutting and hauling firewood, packing furs, working in the sales shop, fishing, or assisting the post tradesmen. The busiest time of the year for these workers was in the spring when the Upper Fort played a major role in the pemmican and buffalo robe trade, and in the shipment of supplies and country produce to interior posts. Tradesmen at the Upper Fort included carpenters, coopers, masons and blacksmiths. They helped to construct and repair buildings at the fort, as well as make the barrels, kegs, and cassettes used in the transport of supplies. To clerks like Robert Clouston, in charge of the “dull and insipid calculations” that inevitably accompanied the retail trade with local settlers and the movement of goods and furs, fell the responsibility for keeping accounts in the post ledger, maintaining inventories, purchasing country produce, and engaging tripmen. When an overland supply route was opened to Red River via St. Paul in 1858, and Upper Fort Garry took on a larger role as an inland depot, the duties and scope of work at the Upper Fort increased, resulting in the construction of new stores and warehouses. Three similarly sized stores, built in the early years of the fort, were located along the western wall. Two more were added outside the north wall in the 1840s (and enclosed during the fort expansion in 1851) while a sixth was added in 1860. These buildings housed furs, trade goods, plains provisions, and imported goods. On the eastern side of the fort stood the sales shop, men’s residence, and a house for the Recorder, or Chief Judge in Red River. The main house, or officers’ residence, stood at the centre of the fort quadrangle. 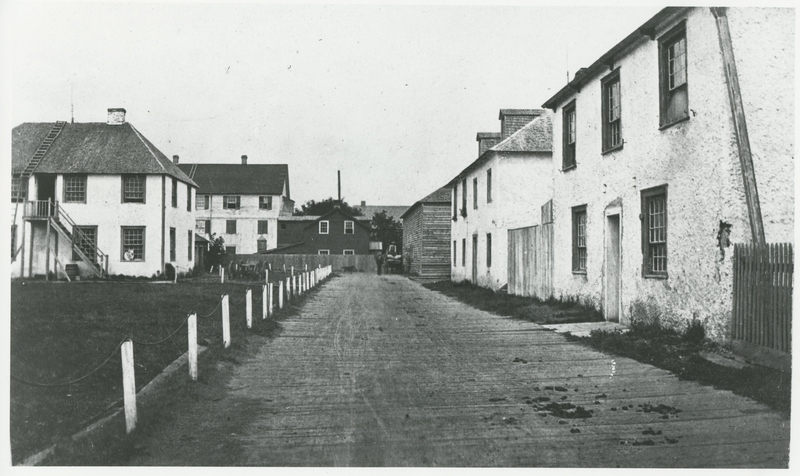 Later, a ‘General Depot’ was constructed in the expanded fort, as was Government House. A number of other smaller buildings — a granary, wash house, forge, and cookhouse — also occupied the fort proper and renovations and expansions became a regular activity, either the result of the fort’s expanded role, or the result of the periodic presence of troops in the settlement. A well and well house were built in the early 1850s, replacing an earlier excavation. Tradition has it that the missing UFG journals were tossed down the second well during the time of the Resistance. If the colony could have had a “downtown” it was at Upper Fort Garry, where trade was conducted, legislation debated, trading and supply excursions mustered, and court proceedings held. Until its dismantling in 1881-88, and the development of commerce at what is now Portage and Main, it was the centre of daily life in the settlement.